Summer heat has enveloped us, so naturally we think of ice cream and sweet tunes to take our mind off the oppressive temperatures. So we think it is a good time to offer you Ice Cream Man Power Pop and More - Songs We Learnt at Sundae School. This album is a compilation of 163 songs (yes, that it not an typo -- 163 songs) from various artists. And it is a free digital download, by individual song or its entirety. Ice Cream Man Power Pop and More is a Swedish radio station devoted to power pop and exposure of bands that haven't been signed by major labels. And they perform a very welcome service. 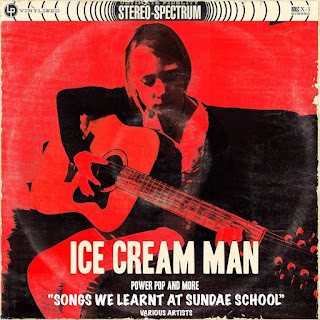 Ice Cream Man Power Pop And More - Songs We Learnt At Sundae School by Ice Cream Man Power Pop and More Records.